Cards are a standard invitation size unless otherwise specified. Each card has handmade origami on the outside, is blank on the inside, and comes with an envelope. Cards are individually packaged in cellophane wrappers and can be personalized for any occasion free of charge. All cards are $3.50 each. Custom orders are available upon request. Please contact us for more information. 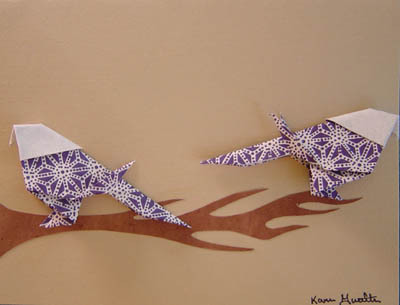 Please note that due to the handmade nature of origami paper and these products; photos are posted as examples only. We have a large stock of colors, patterns, ribbons, and ornament sizes available; please contact us for more information or to place an order.